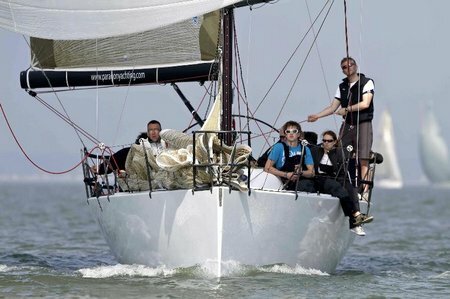 The RORC Easter Challenge, due to take place on the Solent over the first three days of the Easter Bank Holiday (6th-8th April), will offer crews a unique opportunity to jump start their sailing programs. As well as being the first fixture in the RORC’s UK racing calendar, the RORC Easter Challenge doubles as a start of season training event, with on the water coaches providing immediate advice followed by expert post-race video debriefs in the Events Centre in Cowes Yacht Haven. In fact the coaching element of the regatta is taken so seriously that the Racing Rules of Sailing are modified for the event permitting coaches or sailmakers to climb on board during racing if, for example, a crew requests some expert assistance with their sail trim or rig set-up. The coaching this year is being spearheaded by Barry Dunning, who points out that while owners typically spend considerable sums on gear for their boats, coaching is a feature of their campaigns often overlooked. “If they just spent some money and some time on coaching, they would be up the fleet by miles,” he advises. Of course at the RORC Easter Challenge it is laid on for free. This year there will be one new feature to the coaching. With the start of racing on the Friday scheduled for 1300, so, from 1100, lines will be set up allowing participants to carry out practice starts. But it is the on-the-water coaching that is really unique. Not only can coaches climb on board boats, but any crewmembers competing are also allowed to step on to the coach boats to see how their yacht’s trim and set-up looks from off their boat and can even do this mid-race if they so desire – a opportunity rarely allowed in other events. Among the competitors a strong line-up is expected at the RORC Easter Challenge with 10 boats already entered in Class 1, ranging from the largest and fastest, Piet Vroon’s 2010 RORC Boat of the Year-winning Ker 46, Tonnerre de Breskens, to Stephen Anderson’s perennial Cracklin Rosie, the Corby 40. Also entered in Class 1 to date are three Farr 45s and Andrew Pearce’s new Ker 40, Magnum III. Many teams – including both Magnum III and Cracklin Rosie – are using the RORC Easter Challenge as an opportunity to get up to speed before the trials to earn a place in one of the four British teams for July’s Brewin Dolphin Commodores’ Cup. Managed by the RYA these trials start on 5 May with the RORC’s Morgan Cup. In Class 2, another triallist taking part in the RORC Easter Challenge is Jim Macgregor’s Poole-based team on his Elan 410 Premier Flair. “I seem to spend half of my life helping girls get coached at the club, so I am very much in favour it, but I just don’t apply it to myself!” says Macgregor whose two daughters, Lucy and Kate, will be representing Britain at the Olympic Games in the women’s match racing. J/Boats will feature strongly in the RORC Easter Challenge. Niall Dowling, who finished runner up in the RORC’s 2011 overall IRC Championship, has replaced his J/111 with another, his new boat called Jazzband. The boat has only recently reached the UK and the RORC Easter Challenge will be the boat’s first outing. “I was originally going to be getting one in the States and the plan was to do the RORC 600, but work-wise I am stuck in European ground,” says Dowling, of why he’s changed boats. Dowling says that he is planning more of an inshore campaign this year with Jazzband, but is contemplating taking on the Round Ireland Race doubehanded, which he sailed four years ago on a J/105. Several new J/109 teams will also be taking part. From Brighton Robert Stiles will be campaigning Diamond Jem and is another gunning for Team GBR Brewin Dolphin Commodores’ Cup selection, while for Jonathan Bevan’s Jelenko it will be his first time at the RORC Easter Challenge. Having campaigned Richard Tolkien’s Class 40, Tom Hayhoe has his new J/105 Mostly Harmless entered. In addition to the four IRC classes, the RORC Easter Challenge will also feature a separate class for J/80s. With the J/80 Worlds due to take place in Dartmouth in June, the RORC Easter Challenge is an ideal opportunity for teams to get some free training in as they work towards this all-important event for the class. Aside from being the first RORC race of the year in the UK, plus the coaching opportunity, the long range forecast is also suggesting sun and a light to moderate breeze, so the RORC Easter Challenge is lining up to be a perfect way to ease into the sailing season.